Gather round for a heartwarming tale of a dog who started with a tough lot in life and ended up with his happily ever after. 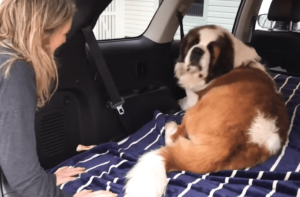 This is the story of a 130-pound Saint Bernard finally finding his forever home. Cosmo the Saint Bernard was born in Nebraska in a breeder’s home. For unknown reasons, the breeder gave Cosmo away to the Hearts United for Animals shelter. (We’re shocked too. Who could resist Cosmo’s face? He’s an absolute doll). Even though Cosmo was confused about his new surroundings, the shelter staff reported he was a friendly, loving pup. Cosmo liked living at the shelter, but the staff wanted to find the affable and sweet pup a place to call home permanently. They posted Cosmo’s profile on a pet adoption site and waited for interested applicants to reach out. Cosmo’s profile caught the attention of a couple living in upstate New York. Jayne, one half of the couple, became enamored with the dog and decided she wanted to bring him into her family. She flew to Nebraska to meet Cosmo. It was love at first sight, and Jayne decided to adopt him. You can’t just put a 130-pound dog in a travel bag and carry him on the plane with you. Jayne had to be creative to bring her newest family member back to New York. Once the adoption paperwork was completed, she rented a car to drive Cosmo the more than 1300-mile trek. Although he was initially nervous about riding in the car, Cosmo spent most of the journey enjoying the ride from a comfortable spot in the back. Once they arrived in New York, Cosmo was introduced to his new life. It included obstacles that Cosmo had never encountered before like stairs, vast amounts of outdoor space for exploration, and two dog siblings to play with: Poppy and Grendel. In the video below, you get to see Cosmo exploring his new house for the first time. He eagerly sniffed out the place and introduced himself to Jayne’s giant rabbit. One of the highlights for Cosmo was meeting Jayne’s children, Alice and Owen. 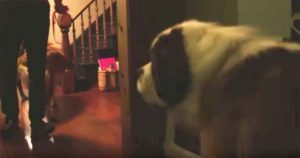 The video shows a thrilled Cosmo getting to know his human brother and sister for the first time. You also get to see Cosmo adapting to his new lifestyle. He learns to love napping on the couch (who doesn’t?) and develops a close relationship with his dog sister Poppy. Cosmo even discovered a new source of drinking water: the toilet! As the days turned into weeks, Cosmo became closer and closer with his new family. It’s like he was born to be with them. “It’s nice to just see him in a big space. See him get to spread out and put his belly on a cool floor. Just to know that he’s staying in this place where he is happy and comfortable,” Jayne says. 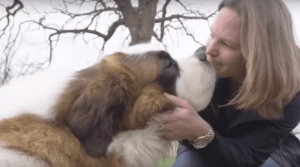 After all his trials and tribulations, this lovable, squishy, Saint Bernard named Cosmo landed with the loving family he so deserved. Watch Cosmo’s story. Try not to cry. We dare you!